BBQ Chicken Recipe makes a savory, slow cooker chicken dinner. It is made easy with homemade BBQ sauce using only four ingredients. You can also bake it in the oven. My sister-in-law shared this recipe with me in the late 1950s. Her original recipe contained only Heinz 57 and ketchup. I added vinegar and chopped onions for an enhanced taste. A few years ago I deleted the onions from the sauce and added the Liquid Hickory Smoke flavoring to create an outdoor grilled flavor. I included the onions here as an option for you. Mix together all ingredients in a mixing bowl, except chicken, and set aside. Wash chicken until water is clear and place parts in the bottom of a slow cooker. Spoon sauce over chicken to coat well. Turn pieces over to coat other side. Place lid on cooker and turn heat to high. Cook for about 1 hour and 15 minutes or until they are done. They will be tender when probed with a fork and starting to turn loose from the bone. Carefully remove cover, turn chicken pieces over and cook about 10 minutes longer, uncovered for the sauce to thicken slightly. Remove to a serving dish. Top with leftover sauce or serve it as a side. Garnish with fresh rosemary sprigs if desired. 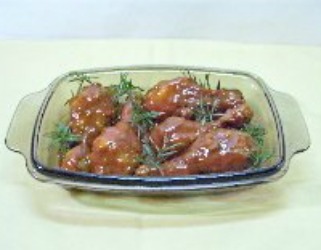 To oven bake, spoon BBQ sauce over chicken, cover with aluminum foil, and cook 30 minutes. Remove foil, turn chicken pieces over and bake another 30 minutes uncovered, until tender and sauce has thickened. Place on serving dish and spoon over more sauce, if desired. A few popular Southern side dishes that compliment this Barbecue Chicken Recipe are BBQ or baked beans, Green Bean Casserole, mashed potatoes, Old Fashioned Potato Salad, corn on the cob or Cole Slaw. *Cut up a whole chicken or use your favorite pieces such as wings, thighs, or drumsticks. A frying size chicken is best used for this BBQ chicken recipe. A broiler chicken is a young chicken that weighs about 1 1/2-2lbs. A fryer weighs up to 3 lbs. and a roaster, which is a mature hen or rooster, weight over 3 lbs. A fryer has more meat than a broiler and less fat than a mature chicken. It is more tender, contains some fat giving more flavor, and cooks up faster than a hen, which is an excellent choice for Chicken And Dumplings. Chicken is an excellent alternative to red meat. It is a complete protein source and contains calcium, phosphorus, iron, vitamins B-1, B-2, B-3, and some other trace minerals and vitamins. The bonus is that it is very tasty and almost everyone likes it!